DC Moore Gallery is pleased to present Romare Bearden: Insight and Innovation, an exhibition that presents some of the finest examples of Bearden’s work in collage, watercolor, and oil, highlighting his mastery of multiple artistic techniques and mediums. While probably best known for his powerful collages, Bearden also created modernist tempera paintings, lyrical abstractions, photographic enlargements that he called Projections, lush watercolors, and jazz and blues monotypes. In 1981, Bearden (1911-1988) completed a unique, large-scale collage titled Artist with Paintings and Model that is both a visual autobiography and his only known self-portrait. Depicting himself holding a brush with his arm draped over a painting, he identified the collage as a view of his studio around 1941. Motifs that allude to his artistic training and art historical sources appear throughout, in an evocative narrative of personal history. The painting on the easel in the collage is a depiction of The Visitation of 1941, a strongly modernist tempera on paper that, along with a group of about twenty others, was the first time that Bearden focused on Southern themes and childhood memories, which became the foundation of much of his later work in collage. Through the interplay of abstraction and representation, the painting presents the biblical story of the visit of the Virgin Mary to her cousin Elizabeth as an everyday encounter between neighbors, set in the hills of North Carolina. Seen together in this exhibition, The Visitation and Artist with Painting and Model are major artistic statements that offer a rare opportunity to view key works created by Bearden at the beginning of his career and when he was a mature artist. After working in varying degrees of abstraction in the 1940s and 1950s, Bearden entered a decisive new phase during the turbulent decade of the 1960s. Inspired by the momentous social and political developments at the time, and the formation of Spiral, an African American artist’s group, he launched wholeheartedly into collage and photomontage, which he soon developed into a series of large-scale photostats that he called Projections. His earliest collages are relatively small in size and composed almost entirely of images cut from magazines and newspapers. Rooted in Cubism and Dada collage, they are characterized by bold fragmentation and fractured forms, irregular scale and proportion, and complex layering of motifs. When blown up as photostat Projections, they became powerful black and white photographic images that resonate with an immediacy that reflects the churning and often clashing cultural currents of the decade. By the late 1960s, Bearden was generally working on a larger scale and constructing spaces that were more suggestive of actual places. In Big Sister of 1968, he evokes a moment shared by two sisters, probably inspired by memories of his youth in Mecklenburg County, North Carolina, in which the girls are the central focus of a room of fractured forms, flattened space, and tilted tabletops. Bearden’s collages brought him national recognition and established his reputation as a leading contemporary artist. At the same time, he added a new dimension to his art in the 1970s by painting lush watercolors on tropical themes inspired by visits to the Caribbean island of St. Martin, the ancestral home of his wife, Nanette. From about 1974 to 1983, Bearden also created freely worked, broadly painted, and highly expressive monotypes. Jazz and blues themes predominate, as in Kansas City Walking Bass, which captures the essence of a performance through the fluid application of paint. Bearden’s more painterly approach is also seen in many of his collages from the 1980s. Two landscapes from 1983, September – Sky and Meadow and October – Towards Paw’s Creek are excellent examples, bold, richly textured works rendered in the fall palette of North Carolina, with a density that heightens their seasonal intensity. 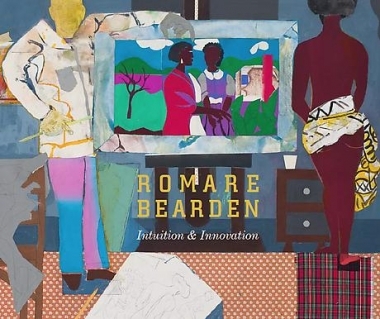 Recognized as one of the most original visual artists of the twentieth century, Romare Bearden has work in public collections across the country, and has had a number of major retrospectives, including a comprehensive traveling exhibition organized by the National Gallery of Art in 2003. Most recently, the Mint Museum of Art in Charlotte, North Carolina organized a traveling exhibition in 2011, in honor of the centennial of the artist’s birth.